Old amalgam fillings are unattractive and leave your teeth vulnerable to further decay. 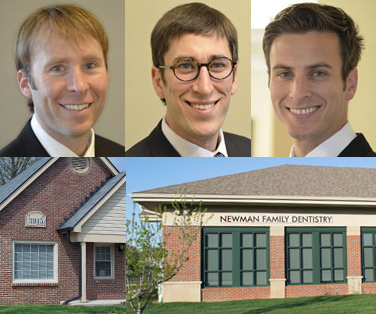 Today, dentists at Newman Family Dentistry use only composite fillings. Rather than introducing metals including mercury into your mouth, composite fillings are a mix of non-reactive synthetic materials that provide a firm bond to the surface of the tooth. These tooth-colored fillings look better, last longer, and prevent further damage to the tooth. Composite fillings bond with your teeth fully, reducing the likelihood of further tooth decay. Dentists drill less when fitting composite fillings, keeping more of the natural tooth structure intact. Temperature changes have little effect on composite materials, so there's less risk of your teeth cracking. Modern composite fillings are less likely to fall out, requiring further dental work. The composite resin can also repair broken, chipped, or worn teeth. Years ago, composite fillings tended to wear out long before amalgam, but materials and techniques have advanced significantly since then. When properly applied and cared for, our tooth-colored fillings generally last five years or more, eliminating your worry and the need for frequent return trips to the dentist’s office. We start by using a physical exam and a digital X-ray to locate areas of decay in your teeth. The dentist will discuss your options and make recommendations. He'll let you know if you need a crown or if a tooth-colored filling will be sufficient. After completely numbing the tooth, the dentist will use a drill to remove the decayed structure. Where fillings are needed, he'll hue the material to precisely match your teeth. The dentist applies the composite resin in layers, curing each layer to ensure a secure bond. The last step will be to shape the surface of the filling to fit perfectly in your bite. One of our dentists in Indianapolis or Carmel may recommend a root canal for teeth with deep decay. If time is short or if you prefer to spread out the time in the dental chair temporary fillings are available, which will later be replaced with permanent composite resin fillings. The results are always natural-looking and durable. Make sure to brush, floss, and rinse twice per day. Eat a balanced diet, especially dairy, fruits, and vegetables. Avoid biting down on hard object such as ice. Continue to make frequent trips to the dentist. We encourage our patients to visit us at Newman Family Dentistry at least twice per year (every six months) to keep that smile looking and feeling great. In addition to cosmetic fillings and dental cleanings, we can help you develop a dental health routine to keep your smile healthy for years to come. We encourage you to schedule an appointment at our Indianapolis or Carmel dental office today. Our team can answer any questions, and will work hard to make sure you feel comfortable and taken care of.